The private spaceflight company SpaceX is once again counting down to launch an unmanned Dragon cargo ship to the International Space Station today (April 18) after nearly a month of delays. SpaceX is slated to launch its third official Dragon cargo run to the space station from the Cape Canaveral Air Force Station in Florida today at 3:25 p.m. EDT (1925 GMT). Once it launches atop the company's Falcon 9 rocket, the Dragon capsule is expected to deliver about 5,000 lbs. (2,268 kilograms) of food, supplies and experiments to the six crewmembers living and working on the space station. SpaceX initially attempted to launch the Dragon cargo mission on Monday (April 14), but the company called off the launch try after detecting a helium leak in the Falcon 9's first stage. 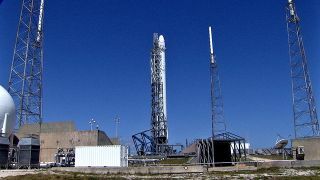 The Dragon launch was also delayed in March due to a damaged ground-based tracking radar used during the launch in Florida. If Dragon does launch today, it is expected to rendezvous with the station on Sunday morning. SpaceX could also attempt a launch to the station on Saturday (April 19), when the weather appears to be more favorable, according to a NASA update. SpaceX's Dragon is ferrying some interesting supplies up to the station. The Dragon capsule is carrying prehensile legs for Robonaut 2, a humanoid robot designed to eventually aid astronauts in their station tasks. Veggie, a mini-farm experiment used to grow lettuce in space also has a space aboard, and a microbe experiment orchestrated by a group of former and current cheerleaders is flying to the station as well. The Falcon 9 rocket launching today is also equipped with something special. SpaceX has equipped the rocket with four landing legs, each one 25 feet (7.6 meters) long, to test out part of a reusable rocket technology experiment. In 2013, SpaceX relit the nine rocket engines on its Falcon 9 rocket, slowing it descent to Earth after depositing a satellite into orbit. Today's test will couple that re-entry maneuver with a landing exercise, which could deliver the first stage of the rocket to a specified zone in the Atlantic Ocean. If it goes well, the rocket would make a verticle landing before falling over into the water. It's a very experimental technique, however. The chances of success are only estimated at about 30 or 40 percent, SpaceX officials have said. Today's planned SpaceX launch is coming days before NASA astronauts on the station will need to perform a spacewalk to repair a backup computer that failed last week. The system's primary computer is still in working order, but NASA astronauts Mike Swanson and Rick Mastracchio will need to venture outside of the space station on April 23 to swap out the faulty computer with a spare. This mission will be the third of 12 cargo missions to the station for SpaceX under a $1.6 billion contract with NASA. Hawthorne, Calif.-based SpaceX launched its first cargo mission to the outpost in 2012. SpaceX isn't the only company with a NASA deal. Orbital Sciences Corp., another spaceflight company has a $1.9 billion contract to perform eight cargo missions to the station using the private company's Antares rockets and Cygnus spacecraft.